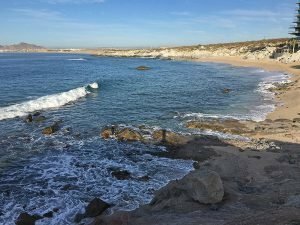 Cabo San Lucas to San José del Cabo, Los Cabos, Baja California Sur, Mexico. The 18 mile Cabo San Lucas Tourist Corridor connects San José del Cabo and Cabo San Lucas. 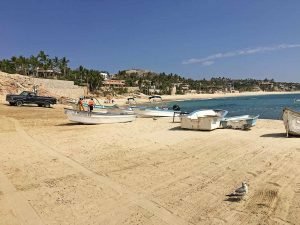 Here you will find your choice of popular beaches including Playa Santa Maria, Chileno, Monuments Beach, Twin Dolphin Beach, Costa Azul, Palmilla, Playa Acapulquito, Bledito, Playa Cabo Real and more. Don’t feel like renting a car? 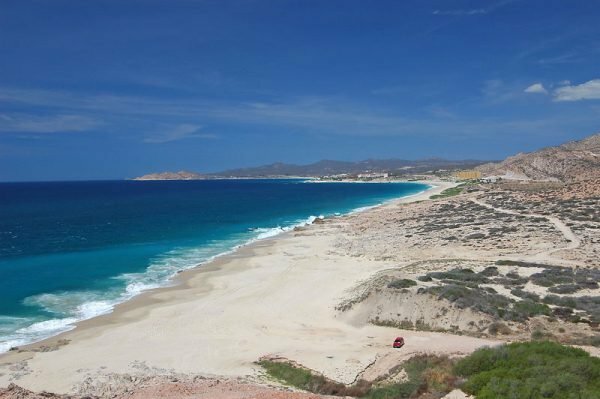 Autotransportes del Noroeste, SuburCabos, and InterBaja buses run approximately every 20 minutes back and forth from San Lucas to San José, daily from 6:30 a.m. to 11 p.m. with stops near most beach accesses. Let the driver know your stop in advance. The 2005 fare is about $1.50 U.S. each way, but remember that U.S. and Canadian coins are not legal currency in México. 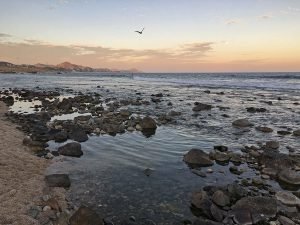 Tour companies also organize snorkel, kayak and beach trips, by van or boat, to Bahía Santa María and Bahía Chileno, midway through the twenty mile-long Tourist Corridor. 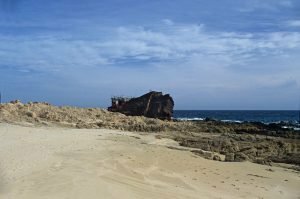 The rusty wreckage of a Japanese freighter remains on the rocks of this once popular beach area. Now, the wreck provides a spectacular backdrop for the “Ocean” finishing holes at the Jack Nicklaus Cabo del Sol course. Soon, it will surpass its original popularity with the completion of the new Hacienda Del Mar Hotel now under construction. This old wreck has now been removed as the Golf Course and Sheraton Hacienda Del Mar Hotel have been completed. Playa Las Viudas was formerly called Twin Dolphin Beach and is located just southwest of the now demolished old Hotel Twin Dolphin. This picturesque beach is a quiet spot to relax and have a picnic. There are no services. Access: Km. 11.5, along the Corridor. The entrance is marked. Photo: February 2016. At Km. 13, Just east of the Hotel Twin Dolphin, this horseshoe-shaped gem tucked between two bluffs is a protected marine sanctuary. Perfect for families with very good swimming, snorkeling and dive sites offshore. Now a Blue Flag Beach. Photo on right: March 18 2016. At Kilometer 18, you’ll find the Rio Caracol Beach Club, so named for all the fossilized snails found in the adjacent arroyo. This beach club has a lovely palapa restaurant with a wading pool, pergola covered chaises located below on the beach, showers, pretty decent restrooms, and free ocean kayak usage for patrons. What you won’t find are bothersome beach vendors but please note that your own food or coolers are not allowed. If you want your frosty mango margarita refilled, all you have to do is plant the pennant flag (located near your chaise) in the sand and a waiter will promptly take your order. 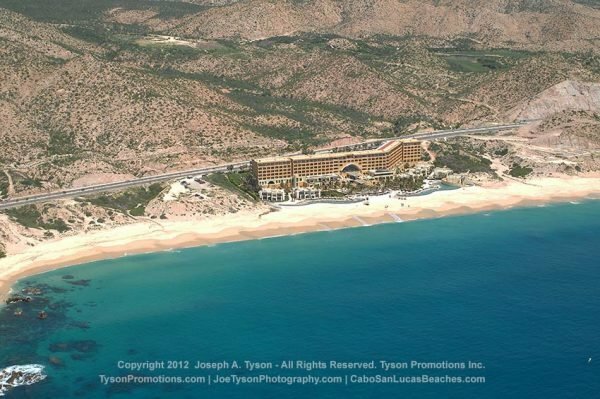 Note: January 2005 – The above information is from our Los Cabos Magazine, Issue 8 from 2003. The beach club has been closed since 2005. We will update the access to the beach when available. 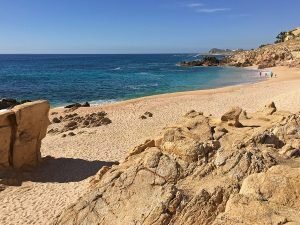 Playa Bledito is just west of the protected cove of Playa Cabo Real. 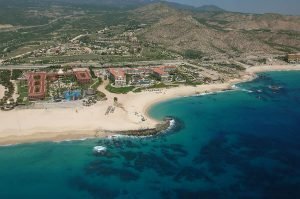 Playa Bledito, in front of the Meliá Cabo Real and the Hilton Los Cabos, is a safe swimming beach created by a man-made breakwater. The easiest access is also through Hotel Meliá Cabo Real (photo on right) at Km 19.5. 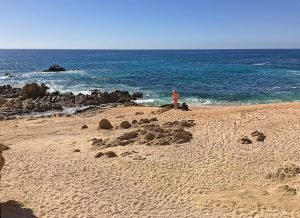 The beach known as Buenos Aires that runs to the Meliá Cabo Real Beach and Golf Resort at Kilometer 19.5, is largely deserted and is thereby a natural alternative for seekers of quiet solitude. 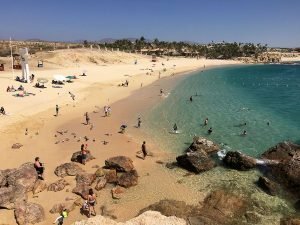 Playa Bledito in front of the Meliá Cabo Real and the Hilton Los Cabos, is a safe swimming beach created by a man-made breakwater. Note: As of April 2004, this beach club has been closed to the public. Small rocky cove with nice beach, palapa, swimming pool, tide pools, showers and restaurant and bar. 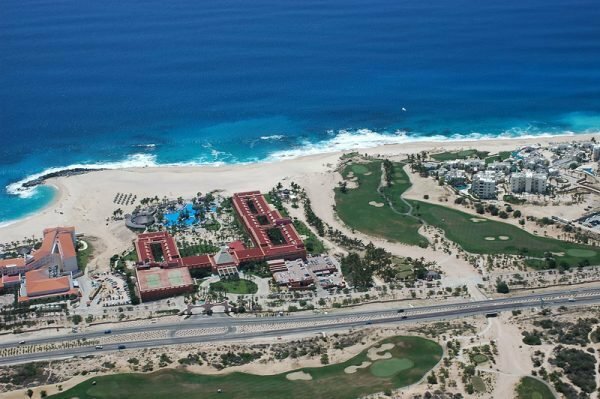 Turn into the entrance to Meliá Cabo Real Hotel, then turn left and follow the paved road to the end. The beach club is to your right, down the hill. 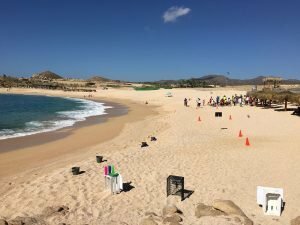 Go down the driveway to the Westin Regina Resort Los Cabos and take a right on the dirt road down (taxis park in this area) to the beach. Follow the road as far as you can, then back up just a little. Note: May 2007 – Most of this beach now fronts golf course, and resort development and construction. The privacy that previously was found on this strech of beach is no longer available.